An easy and delicious appetizer that can be made ahead of time. These creamy, cheesy, crab stuffed mushrooms are wrapped in bacon for the perfect appetizer! 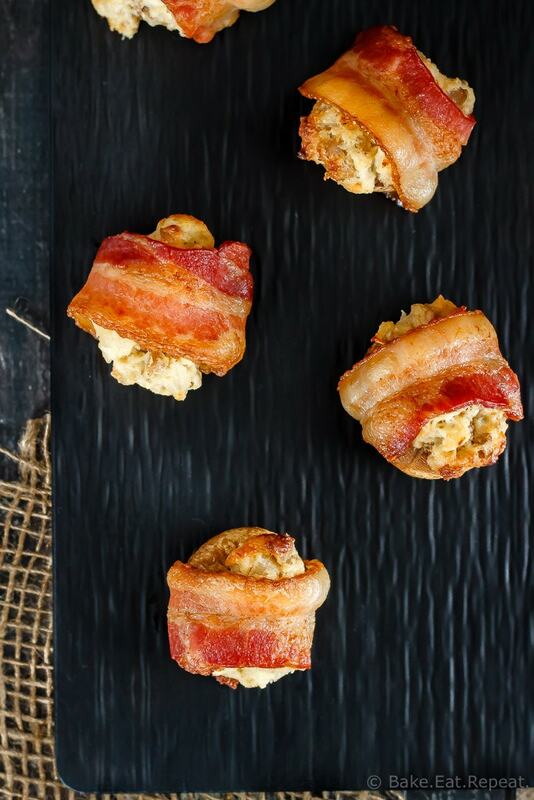 Bacon wrapped crab stuffed mushrooms today – because the holidays call for a little indulging. And I’ve probably given you enough sugar already this month to last for the next couple of years so I thought we’d branch out a bit today! As much as I enjoy the Christmas baking, I find you also often need a great appetizer for parties and things during the holidays. And these bacon wrapped crab stuffed mushrooms are perfect. I made these for Christmas Eve a couple of years ago. My extended family always gets together for Christmas Eve and everyone brings various appetizers and treats for a giant potluck dinner. And it IS giant because my family is huge – so much good food. These stuffed mushrooms didn’t take long to disappear, and since then it’s the first appetizer I think of when I need to bring one somewhere! The wonderful thing about these crab stuffed mushrooms is that you can make them ahead of time. Make them a day ahead and refrigerate them before baking, or make them and freeze them before thawing and baking, or you can bake them and then allow them to cool and freeze them to reheat later. So many options. These were also delicious without the bacon if you prefer plain crab stuffed mushrooms. 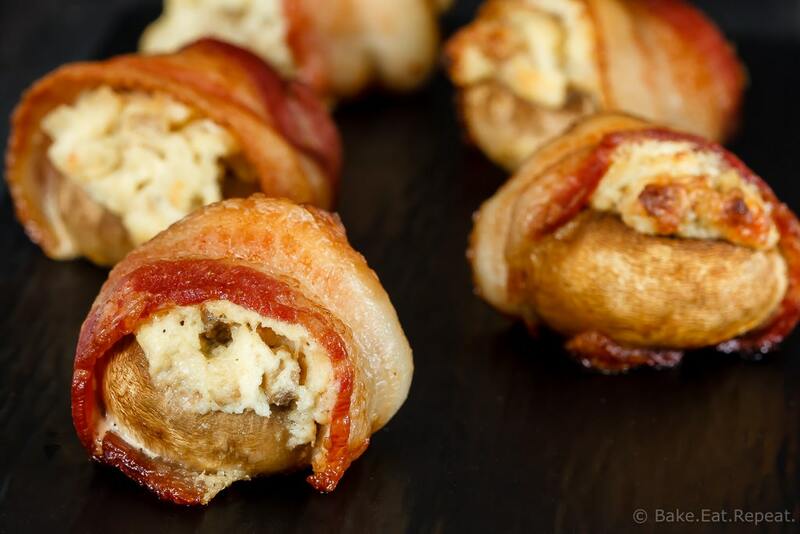 Although in my opinion, more things should probably be wrapped in bacon, so….you know which option I’m going for when I make these! the bacon is optional here – if you’re not using it, lower the oven temperature to 400 degrees F and bake for 20-25 minutes or until the tops are golden brown. Make sure to line your baking sheet with parchment paper or a baking mat (I love these ones) so your mushrooms don’t stick. the mushrooms can be prepared a day in advance and kept in the refrigerator until baking, or you can prepare them and then freeze them before thawing and baking, or bake and then freeze to reheat them later. From frozen reheat at 350F for 20-25 minutes until heated through. Preheat the oven to 425 degrees F. Line a baking sheet with a silpat mat or parchment paper and set aside. Wash the mushrooms and pop out the stems. Chop the stems finely. In a large non-stick frying pan over medium heat, saute the onions until softened. Add the garlic and the chopped mushroom stems and season with salt and pepper. Continue to cook for 3-4 minutes until the onions have browned and the mushrooms have released their liquid. Remove from the heat and set aside. In a large bowl, mix together the cream cheese and the egg yolk until well combined. Stir in the parmesan cheese and the crab meat. Add the onion mixture and stir well. If the mixture is really soft, place the bowl in the fridge for 5-10 minutes to allow it to firm up before filling the mushrooms. Scoop the filling into the mushroom caps and place them on the baking sheet. Fill them up as full as you can, it can be heaped up a bit. 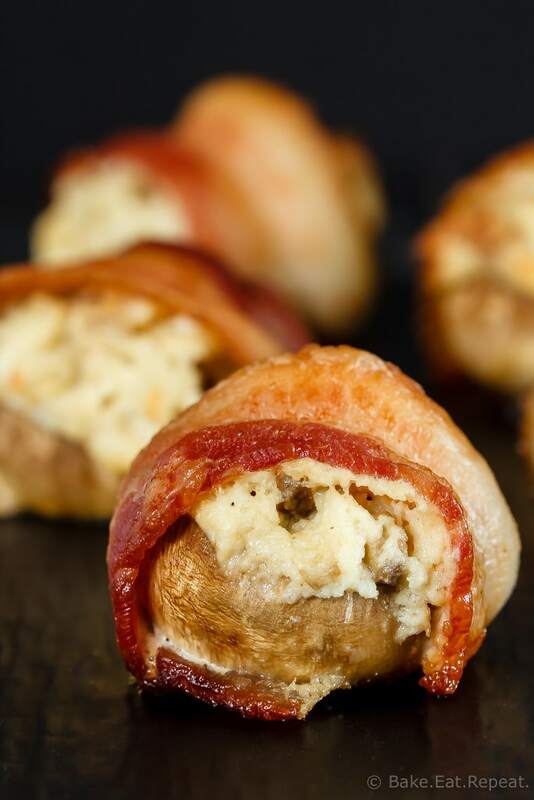 If you’re using bacon, take half a piece of bacon and lay it across the top of the filled mushroom cap and wrap the ends around, setting it down on the baking sheet on top of the ends to hold them in place. Repeat with the other mushrooms. Bake for 20-25 minutes or until the bacon is as well cooked as you would like. Let them cool slightly before eating. The bacon is optional, I made half with and half without and both were great, so whichever you prefer. If your mushrooms are on the larger side, half a piece of bacon may not be long enough to wrap all the way around - for smaller button mushrooms a half piece was perfect. If you’re not using bacon, lower the oven temperature to 400 degrees F and bake for 20-25 minutes or until the tops are golden brown. This recipe can be easily doubled. The mushrooms can be prepared a day in advance and kept in the refrigerator until baking. Or you can prepare them and then freeze them before thawing and baking. Or bake and then freeze to reheat them later. From frozen reheat at 350F for 20-25 minutes until heated through. Thanks for this awesome recipe. I think it is likely perfect as is but I made some changes that worked really well so i’ll share here. I am not a big fan of cream cheese so I wanted to cut it down a little. I used 4oz of cream cheese and 1/2 a cup of feta. I did not add the parmesean to the cheese mixture. Instead, when the appetizer was almost cooked, I pulled it out of the oven and liberally grated the parmesean over the top. The other thing a did was stick a toothpick through each of them horizontally to make them easier to serve. They were a huge hit and I’ll definitely make them over and over again! Sounds so yummy! I'd love to try them but sadly I'm allergic to shellfish. Any ideas of something to replace the crab? Thanks Rebecca! The only things I can thing to replace the crab is other seafood, if you want it to be similar. So if you're not allergic to fish you could try that. Otherwise, maybe you would like these taco stuffed mushrooms instead! Hi there - if I couldn’t eat shellfish, I would stuff these with artichoke and maybe some water chestnuts finely chopped up as well! I think the artichoke would substitute the crab really well...just make sure that you get most of the moisture out before adding to the cheese mixture. So i made these last night for friends. Oh my gosh! So, so, so yummy and scrumptious! I wish i would've made twice as many,they disappeared so fast. Will be making these regularly from now on. Thanks! just got done making 24 large ones. It's only 10am so I'm going to work in my vegetable garden then cook these for lunch. I will be freezing some and give some away to family. Thanks for the great recipe! Thanks so much Kevin! I hope you enjoy them! 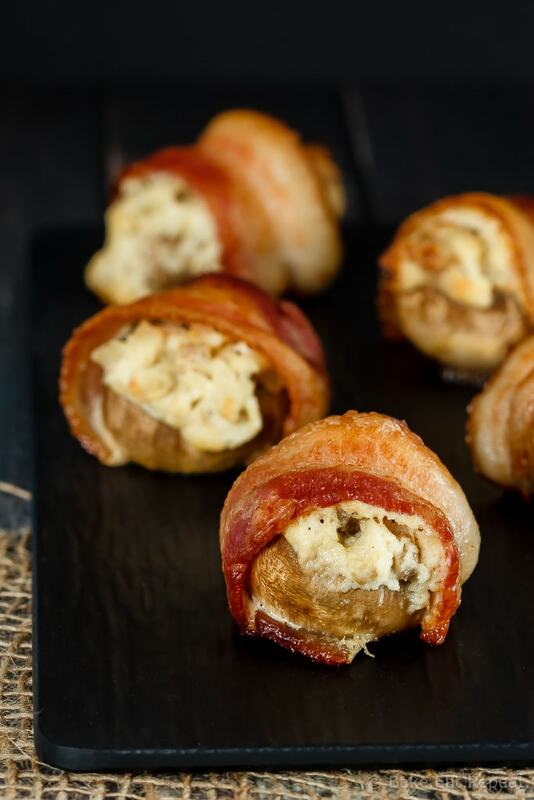 I once attended a party where they served stuffed mushrooms, they were meatless I think maybe cream cheese and matzerella cheese, not sure of ingredients, they were heavenly spiced, I believe I would enjoy the recipe if possible? ?? Hi Juanita, I think that these would be fine if you just omit the crab meat/bacon if you want them to be meatless, it would just be a cheese stuffed mushroom cap then, which I think would still be good! You could maybe toss in some chopped bell peppers or something instead? Or another veggie? Let me know if you try it! I may have missed it, but what size can of crab did you use. This recipe sounds amazing! Thanks Anne! Sorry about that, I've updated the recipe to include the size now. It was a 120g can (4 oz) of crab meat. mmm mmm and mmmm again, Stacey. Those crab-stuffed mushrooms were the best! As I mentioned earlier, I wanted to try this recipe as a dinner and we did. It was awesome, served with a Caesar Salad and rice. Thanks!